Ugh… we’re having a snow day here in Virginia so I was looking online for some recipe inspiration and I stumbled upon a yummy looking Chocolate Dutch Baby (or German pancake), which got me thinking… what if I took that chocolate idea and elevated it a bit by adding sweetened whipped cream and a delicious cherry topping? That was it - I decided making a Black Forest Dutch Baby would be part of my snow day activities! So glad I did because it’s definitely a treat worth trying, snow day or not. We’ll start by making the cherry topping. 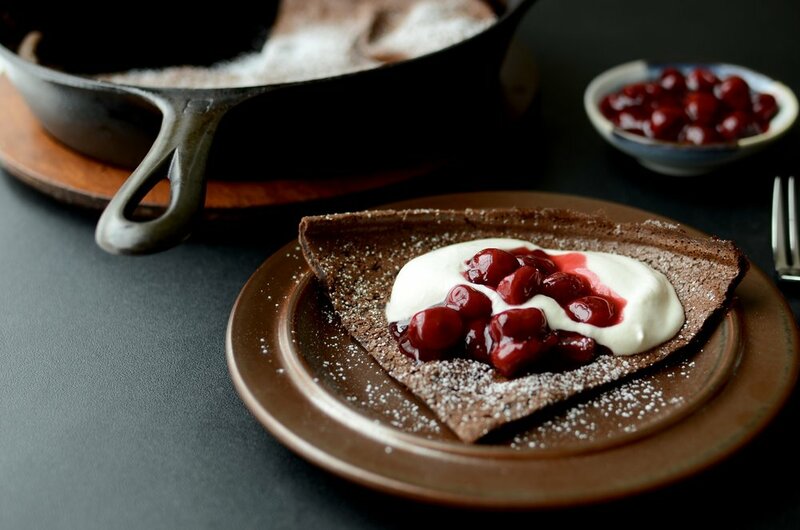 In a skillet over medium-high heat, combine tart cherries, sugar, cornstarch, and a salt. I used tart cherries I stashed away in the freezer this past spring, but if you have fresh tart cherries, you can certainly use ‘em. Cook, stirring constantly until the mixture begins to boil; continue cooking for a full minute, then turn off the heat. mmmm… set the yummy cherry topping aside until needed. The Dutch Baby (German Pancake) is really easy to make… just preheat an oven-proof skillet in your hot oven, melt the butter in the skillet and swirl it all around, then pour the excess melted butter into the a blender with all the other dutch baby ingredients, give it a whirl, and pour the batter into the prepared skillet. For some reason I didn’t get any photos while I was making the chocolate dutch baby, but you can see exactly how it’s done here in my Vanilla Dutch Baby post from a few years ago. The only difference, besides this one being chocolate instead of vanilla, is that this recipe is made in a smaller skillet. The Dutch Baby will puff up in the oven and collapse almost immediately upon removal. To serve, cut the dutch baby into 4 wedges and top with sweetened whipped cream and the cherry topping. Enjoy! In a small saucepan over medium-high heat, combine cherries, sugar, cornstarch, and salt; bring to a boil, stirring constantly; continue cooking for a full minute. Remove from heat and stir in pure almond extract; set aside until needed. Preheat oven and 9-inch cast iron skillet in the center of a 425F oven. In a blender, combine the eggs, sugar, salt, flour, cocoa, and milk; set aside until the next step. Carefully remove the hot skillet from the oven and add the butter. Swirl pan until butter is completely melted and coats the entire pan; pour excess butter into batter and mix to combine. Slowly pour the batter into the hot, buttered skillet and return to the oven; bake for 12-15 minutes or until the dutch baby puffs up (it will deflate almost immediately when removed from the oven so don’t be alarmed when this happens). Remove from oven and allow to cool slightly before topping with cherry topping and lightly sweetened whipped cream. Note: try to avoid pouring all the batter into the skillet in one spot - the force of the pour will remove the butter coating in the pour spot and the pancake will inevitably end up sticking. To avoid this, I like to hold an upside down serving spoon a few inches over the skillet and pour the batter slowly over the back of the spoon while moving the spoon around the skillet. This helps diffuse the force of the pour. cherry topping adapted from Rose Levy Beranbaum from RealBakingWithRose; chocolate dutch baby adapted from Deb Perelman from SmittenKitchen. I've been having a blast playing with my new sous vide circulator. This week I have a great cheesecake recipe to share, but instead of being baked in a springform pan, it's cooked in tiny jam jars that are submerged in a hot water bath. How cool is that? I've omitted the graham cracker crust that usually lines the bottom of a cheesecake, but you could certainly add a thin layer to the bottom of your jars... or sprinkle crushed graham crackers on top just before serving. Eating Keto? My recipe can easily be made keto-friendly by replacing the sugar with an equal amount of granulated splenda (I do not like the flavor erythritol imparts in this recipe). The keto stats for one serving are as follows: 4g carbs, 6g protein, 27g fat, 245g sodium, 280g calories. For the cheesecake batter you'll need cream cheese, eggs, sugar (or splenda), and pure vanilla extract (use the good stuff!). Make sure the cream cheese and eggs are room temperature so leave them out on the counter for several hours before using. The amount of batter this recipe makes is small so I like to mix it in my small food processor (I love this thing). Process until completely smooth, scraping the sides of the bowl as necessary. Divvy the batter evenly among eight 4-ounce canning jars (these are the ones I used). If you want to be super precise, you can weigh the amount of batter going into each jar (my favorite scale). Now for the best part, the super yummy topping! To make the topping, whisk together sour cream, sugar (or granulated Splenda), and pure vanilla bean paste. You can use vanilla extract if you don't have vanilla paste, but trust me, the paste is amazing and you'll love seeing all the vanilla specks when you open those jars (this is the vanilla paste I can't live without). Can you see all those tiny vanilla bean seeds? Heaven! I guess I didn't get a photo of the topping all whisked together, but it only takes about 20 seconds to do. Evenly distribute the topping among the jars. Close the jars "fingertip tight" like you would if you were canning/preserving. If the lids are too loose, water will get in the jars; and if the lids are too tight, the jars could explode so here's an easy way to know what "fingertip tight" is - place screw band on the jar and turn just until you feel resistance, then turn the band one-quarter turn more. Place the jars in a heat-safe container large enough to hold all the jars and a sous vide circulator, and yes it's okay to stack the jars (I used an 8-quart stockpot in the photo above). Also, place the cooking vessel on a heat-proof surface away from children or pets. Add water to cover the jars, making sure the water level falls between the minimum and maximum levels indicated on your sous vide circulator. Bathe the cheesecakes at 165F for 90 minutes. I've seen a few recipes that call for cooking to 175F, but I think the finished texture is a bit softer and more pleasing if you cook them to 165F. After 90 minutes, carefully remove the jars from the hot water. As the jars cool, you may hear that familiar popping sound as a vacuum forms under each lid - such a satisfying noise! Once the jar lids have popped (and don't worry if they don't), remove the screw bands and allow them to dry (if you leave the screw bands on the jars, they may rust). Allow the jars to sit on the counter for about an hour, then chill for at least 3 or 4 hours before serving (or up to 5 days). Serve these little guys directly from the jar. I use a JarKey to easily release the vacuum sealed lids - if you're gentle, I promise you'll be able to reuse the lids again and again. I wrote a short post about the JarKey a number of years ago - here's a link if you're interested in seeing it. Note: reusing lids is not recommended when canning/preserving for long-term storage, but we're not doing that here so it's fine to reuse the lids. Aren't they cute? And they're easy to store (stack them in the fridge), easy to serve (no messy cutting), and easy to transport (tuck one into your lunch bag). They're great as is, or you can add a little fruit topping - my favorite is blueberry - I make a quick sauce by thawing 1 tablespoon of frozen blueberries in the microwave for 10-20 seconds until soft and mushy, then I allow them to cool and thicken for a minute or two - no sugar or thickeners needed. In the bowl of a food processor, combine cream cheese, eggs, 2/3 cup sugar, and pure vanilla extract until completely smooth, scraping down sides of bowl as needed. Alternatively, you can mix by hand, but be careful not to incoporate as little air as possible. Evenly distribute cheesecake batter among eight 4-ounce jam jars. In a small mixing bowl, whisk sour cream, 1/4 sugar, and vanilla bean paste; pour evenly over cheesecake mixture. Top jars with canning lids, followed by screw bands that are tightened "fingertip tight" (see notes below). Place jars in a heat-safe container large enough to hold all the jars and a sous vide circulator (it's ok to stack the jars) and place the container on a heat-proof surface away from children or pets. Add water to cover the jars, making sure the water level falls between the minimum and maximum levels indicated on your sous vide circulator. Cook the cheesecakes for 90 minutes at 165F, then remove from water and cool for 1 hour (remove screw bands to prevent the lids from rusting). Chill cheesecakes for at 3 or 4 hours before serving (or up to 5 days). Recipe can be made Keto-friendly by replacing sugar with an equal amount of granulated splenda (may also substitute erythritol following manufacturer's suggested equivalent). To tighten jars "fingertip tight" - place screw band on jar and turn just until you feel resistance, then turn band one-quarter turn more.